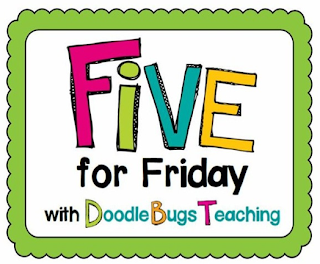 Of course, I am linking up- I LOVE Five for Friday! Having a tiny peek at everyone's week is such fun! 1. This Friday there wasn't a "Shrek Shadow" to be found. (I am beginning to notice a cartoon-y theme for this family). 2. 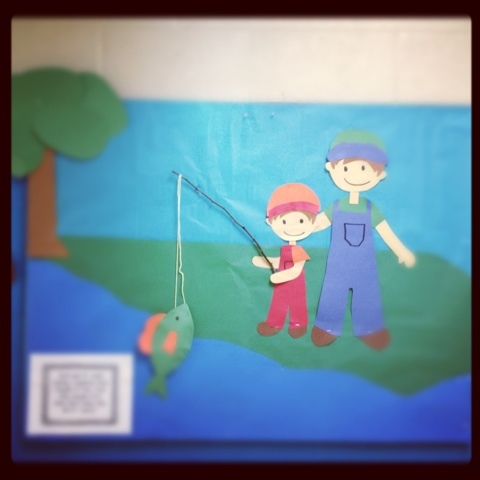 To go along with our Fishing for Fluency Activities, we did a Math Task about fishing. I worked on the display for it on and off for the last day and a half. 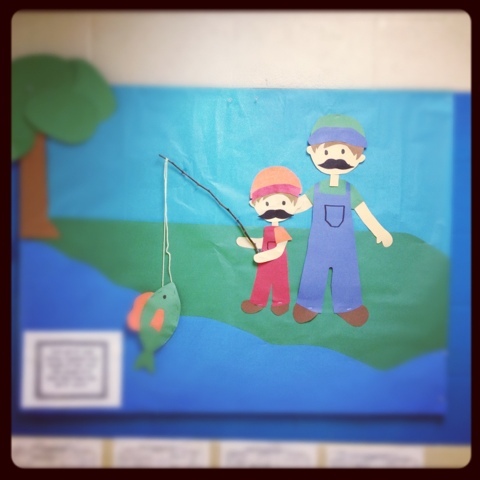 As other classes passed on their way to lunch, I kept hearing whispers that I was making Mario and Luigi. That was not my intention at all. They were just supposed to be two buds hanging out fishing (they just happen to have the names of my Littles...maybe). But I couldn't take it anymore. If everyone was expecting them to look more like the the Kings of Mario Kart, then so be it! And I am totally leaving it up there, too! 4. Our unit this week was on Magnets. Here's a cool activity we did today. 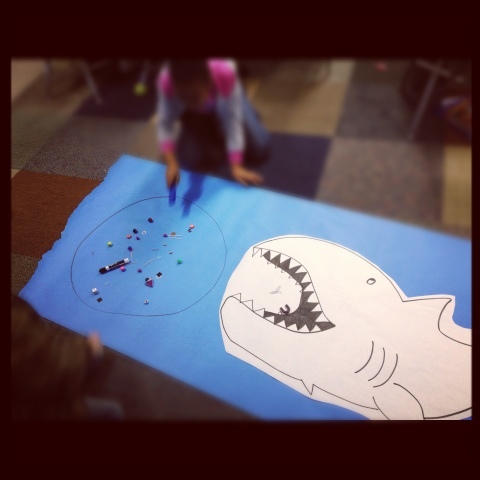 They had to "feed the shark" by using the magnetic wand and pulling the food over. The food was in the horrible non circular circle. It consisted of metal items and non metal items. When they were finished they had to write about what they were able to feed him and what wouldn't move. 5. I didn't take as many pics as I normally do this week. 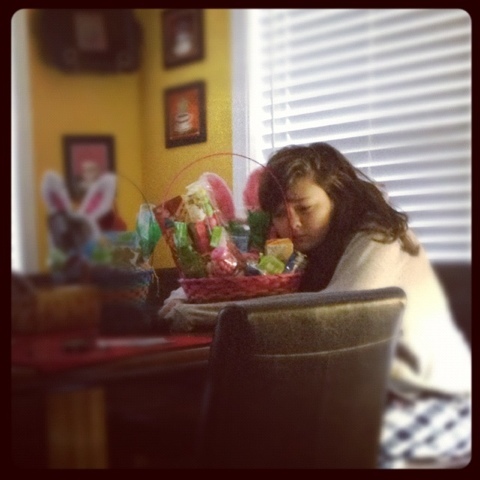 So I am going to share one of Chickadee from Easter morning. Well that does it for me tonight- Chickadee and I have a scary movie date night!!!! Haha, I posted a .gif, too! I love that magnet fishing idea, I'm really trying to find more fun firstie science ideas! You are the only other person I have heard call it the "Shrek shadow"! I love the idea of feeding the shark! I am only going to be able to fit in a day or two for magnets this year but I want to do that for sure! Thanks for sharing! HAHAHAHA ! I love your Mario. Great moustache! I am in love with your bulletin board!!!!!!!!!!!!!!!!!!! Bulletin board queen strikes again!! Mario and Luigi...pure awesomeness friend!